I was introduced to the cute little Viking cars by my friend Kirsten, who runs a daycare from her home. They're simple plastic cars with soft plastic wheels in non-marking white. I bought a few more for Sprout at Camelot Kids in the Granville Island Kids Market after he started to show more interest in the one that Kirsten gave us. Viking really lives up to their motto of what they call the five Ss: safe, soft, strong, simple & silent. Made for children 12 months & up, all the parts are somewhat rounded & a little flexible so it would be hard to injure yourself on one. The Swedish designed Chubbies are a nice, chunky size for toddlers but they're still little enough to pop in a diaper bag to take with you. I like the simplicity of them, the bright colours & lack of branding. They're not recognizable models of vehicle, mostly just classic-inspired vehicle shapes like a pick-up truck, a sedan, a convertible, airplanes & work vehicles like ambulances, fire trucks & what Sprout calls 'dumpa tucks'. 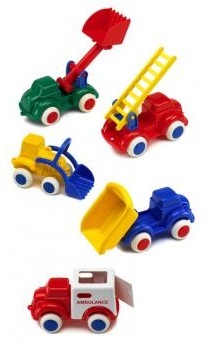 Some have moving parts other than the wheels: the fire truck ladder can be extended upward or folded down; the plane propeller spins; the dump truck can tip its bed up. An added design feature--they make very little noise when rolled along any surface. Though I like to avoid plastic toys whenever possible, the fact that the Viking Chubbies are so durable & easy to clean--you can put them in the dishwasher!--is a big bonus. Their durability makes them more eco-friendly--you won't be tossing them in a landfill because they break quickly. Viking also claims they are recyclable, though the toys aren't marked to indicate which type of plastic they're made of--I doubt they could go in curbside recycling. Possibly the best thing about these little cars is their price: they're around $2-3 each, so pretty much anybody can afford them. Compared to similar priced toys, these seem like much better quality. *I was not compensated in any way by Viking Toys--we just like these little cars!